A sweater from Poetry in Stitches. In the book it is shown as a camisole in blue and two long-sleeved version, red and black. 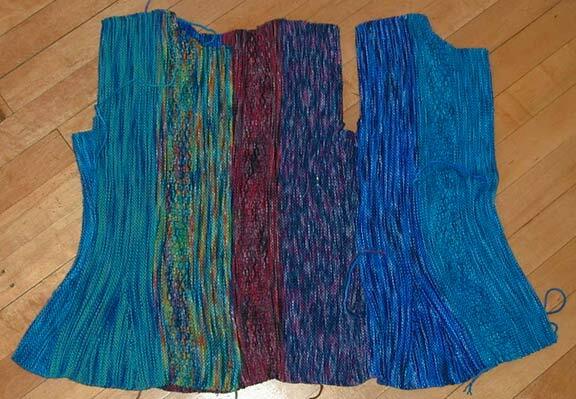 The construction is just like Mermaid - sideways garter stitch with gores at the hem and gussets under the arms. The button holes are done right away so it is easy sailing. Until you reach the hellish construction of the sleeves that is. Done sideways also, you are supposed to shape at the the cap and the wrist . . . I have a sleeve half done and I may as well rip it out because if I do make sleeves, there HAS to be an easier way. Then again, it would make a lovely vest.